[x2jiggy] was given a non-functioning LCD monitor. He made a small effort to trouble-shoot its inability to display anything on the screen but couldn’t get it working again. When that failed he decided to repurpose it as light box instead of just sending it off for recycling. Monitor manufacturers put in a lot of effort to make sure the back lights distribute brightness as evenly as possible and that will make this a pretty good light box. [x2jiggy] starts off the conversion by removing the case. While it was off he gave it a new coat of paint. The LCD panel, the PCB that drives it, and the light diffuser sheets were all removed, leaving just the backlight and inverter PCB. A bit of probing with the multimeter and he even found a place to connect a toggle switch to actuate the inverter’s power. You can see the silver switch he added to the bezel in the image above. The full build video is embedded after the break. ← RedBull creation contest entries revealed! Great, i’have done this to two of founded/restored lcd panels, but i trow away cold catode (lightbulbs anyway) and add led stripes, one 15 inch panel i power by batteries and use a lot in photography and video making, other is powered by brick and sit near my window, after dark i use it as fake sun for reading books, i love it! Great idea to use it for video lighting. Never occurred to me, I’ll give that a go. It would be interesting to adapt this technique to a busted LCD tv for a room lighting. or overhead reading light in bed. If it’s vertical it’s off, flip it down and a mercury switch powers it on. Never seen this done before! Such a great idea, can’t wait to raid my junk pile at work! Recently I had to replace LCD in my laptop and I’m thinking on similar solution (only I’m building own bezel/case with plywood). I promise – I will show after it’s done. The only thing – I’m stuck with lack of inverter (got new screen without one and laptop is using same inverter). Is there any key with inverter models or I need to find identical one? You basically need a CCFL driver that can handle the length of tube you have. They are sold dirt cheap on ebay and most sellers state the size screen you can use them with. I can’t believe the timing on this. I was literally thinking about this yesterday as I have two broken LCD monitors on hand. For some reason I dismissed it because I thought the diffuser needed to have the light source further away but I guess that’s not the case, time to get to work! I was unsure how even the light produced would be without the diffusing sheets but it’s quite good. I don’t know if he mentions in the video, but without the LCD and polarizer and junk, the backlight is *very* bright. This is good news because even an old crappy dim LCD is likely to have bright enough backlighting for this sort of task. Beside of photography, what can it be used for? For tracing-artwork. Lay on the original and the copy paper. You’d be amazed at how good you can see the original. Best of all, it’ll keep the kids occupied for at least –well a hour anyway. Ha Ha. Such a great suggestion – thanks Chris! Sounds like this will keep me occupied, too. Lol! Nice hack, I usually find that “no display” can be the SMD fuse on the monitor’s display PCB directly behind the screen or simply bad capacitors. No backlight can be the same, sometimes the C5707 transistors also blow. Have you considered using multiple coloured filters on each backlight and making an RGYB variant of this? A simple gel filter in front of each tube should be fine for photographic use. I built a light box using the waveguide (a big chunk of (PMMA?)) from an old LCD monitor. I didn’t want to muck around with high voltage or CCFLs so I bought a set of LED strips (DIODER from IKEA). I just taped the LED strips onto the sides of the waveguide and stuck a bit of tracing paper on top to scatter the light. It works really well, is low power/voltage, and really really thin – about 5mm. where did you get your power from. 1500 vac? did you just guess where to wire the switch? seems like youd need to do some checking with a meter before demo. seriously, how did you know. ive got a set of lights, appropriate inverter and corresponding power supply.but thats it. no wires andi dont even know what kinda tv it was. 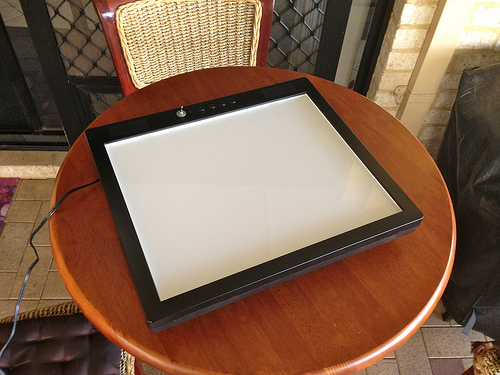 I want a light-box for tracing, made out of a Pc monitor (led or lcd), but this monitor should still function as a normal monitor as well. I want to trace stuff I make in photoshop/3d graphics apps. Problem: simply putting a piece of perspex over the monitor doesn’t work,because the monitor light is too week. and I don’t want to draw on the paper that is just laying on the monitor because its hot and there is some static electricity. I thought about buying a monitor with higher Cd/m2 but that is way expensive. would replacing the backlight with a stronger light bulb do the trick and send more light out of the monitor? I don’t care about image quality/color etc….just need the black lines of whatever I made on the pc. I have a LED monitor broken and i want to use the backlight as a lamp. The thing is that when i turn it on it works only few minutes and then it turns off because it doesn’t have any input signal. Any idea how to leave it on without any real signal or DC converter?. I saw VGA dummy plugs made of resistors but doesn’t work, i think that works on vídeo cards only.